Historians believe that people from nearby Etruscan-Roman villages built the first castle on the site of Montebenichi—one of many defensive fortresses in this strategically important valley between Siena and Arezzo. One of the first family names associated with the castle was the Ubertini family, who were given authority over the castle from the Duke of Tuscany in the early 13th century. Since Montebenichi was on the border between Siena and Florence, it often suffered from constant fighting, causing all the minor vassals to sell their castles to the churches and monasteries and leave. In 1308, the Sienese, with 2,000 soldiers and 300 more mounted on horses, besieged Montebenichi. 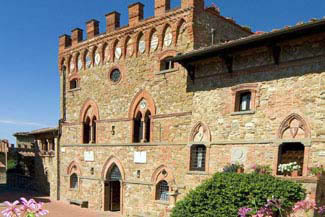 Azzone Ubertini finally sold the castle for 3,162 gold florins to the Florentine Republic. In 1478 the Aragonese in alliance with the Papal army attacked Florence, and Montebenichi was sacked and set on fire after a fierce resistance by its inhabitants. Montebenichi figures in a 16th-century map of Europe, which hangs in the office of Philip II in the El Escorial in Spain, underscoring its importance during the Middle Ages. The hotel doesn’t have its own restaurant, but there’s a little trattoria in the village. You’ll need a reservation. Other dining options are about 20 minutes away by car. The hotel isn’t suitable for children under age 14. Also, because Montebenichi is located on a hill (like many small villages in Tuscany), if you have trouble walking on steep streets, you might find the surrounding area challenging. Montebenichi is about 40 km west of Arezzo and 80 km southeast of Florence. The most best way to reach the castle (and enjoy its surroundings) is by car. If you’re looking for a romantic, hidden-away Tuscan castle with gorgeous furnishings and an utterly stunning view, Castelletto di Montebenichi may just be the place. Off the beaten path in the Chianti region, you’ll pass vineyards and olive groves before winding up a narrow road to the top of a hill and the tiny, medieval village of Montebenichi where you’ll find the castle facing a small plaza. The atmosphere here is both elegant and relaxed. Marco, your personable host who has a profound knowledge of Tuscany, will happily recommend how to best enjoy the area--from wine tastings and cooking classes to a precious church unknown to the tourist masses. You’re only 1/2 hour away from Siena, which you can even see on a clear day. Inside the castle you’ll find fine paintings, sculptures, bronzes, restored frescoes and pieces of Greek, Roman, and Etruscan pottery throughout the public rooms. You can fix your own drink at an open bar and simply enjoy the 360º view of distant mountains and valleys on a rooftop terrace. Guest rooms are uniquely decorated in a combination of period artwork, antiques, and contemporary furniture. Many of them have rough-hewn beamed ceilings. Bathrooms are equipped with showers and/or baths, accented by travertine marble from local quarries. Views can be of the valley, hills, or town rooftops. (The mini-suite is located in a nearby building.) You’ll find DVD players, satellite TV, Wi-Fi, and air-conditioning in each room. Montebenichi is extraordinarily quiet at night. Upon waking up, make your way over to the first floor of the castle and take a seat in the fantastic loggia with beautiful arched windows on three sides. Full of sunlight, it’s here where you’ll enjoy a buffet breakfast before starting your day.